ICTJ’s president David Tolbert will be one of the featured speakers at this year’s Al Jazeera Forum in Doha, Qatar, which aims to explore the complex transformation of the socio-political and media landscapes of the Middle East and North Africa. 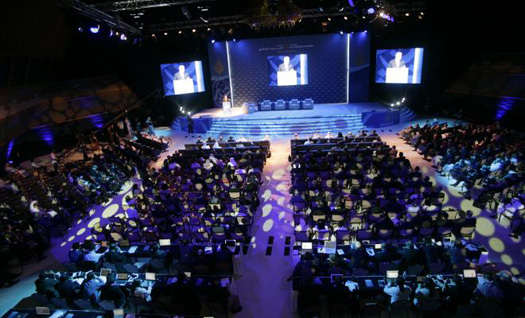 The Seventh Al Jazeera Forum, held from March 16-18, 2013, will provide a platform for political leaders, intellectuals, analysts, journalists, activists, and media experts to engage in discussions about ongoing changes in the region. On March 17, David Tolbert will speak on the panel titled “Post Arab Awakening: Human Rights, Accountability & Transitional Justice.” He will be joined by Salim Ben Hamidane, Tunisian minister of state domains and land affairs, Dr. Amal Obeidi, head of the Department of Political Science at the University of Garyounis in Benghazi, Libya, and Dr. Yassin Al Qubati, secretary general of the Yemeni Center for Transitional Justice. The panel will explore the challenges of implementing transitional justice measures after repression or conflict, and how these efforts intersect with the rising role of media as a tool to promoting human rights and accountability. As transitional justice continues to take center-stage in regional debate, the panel will assess different transitional justice concepts and tools, including criminal accountability, reparations, vetting processes, and truth-seeking. The panelists will address political commitment to sustainable peace and respect for human rights, as well as the role of media in consolidating the principles of transitional justice. As part of the series of events preceding the Al Jazeera Forum, Tolbert will speak in a session about the challenges facing journalists covering justice-related issues working in conflict zones, which will be hosted by Al Jazeera’s department of Public Liberties and Human Rights. On March 15, ICTJ’s Communications Director Refik Hodzic will speak to journalists from the region at the training course on human rights, humanitarian law, transitional justice and protection of journalists, organized by the Norwegian Centre for Human Rights, in cooperation with Al Jazeera.